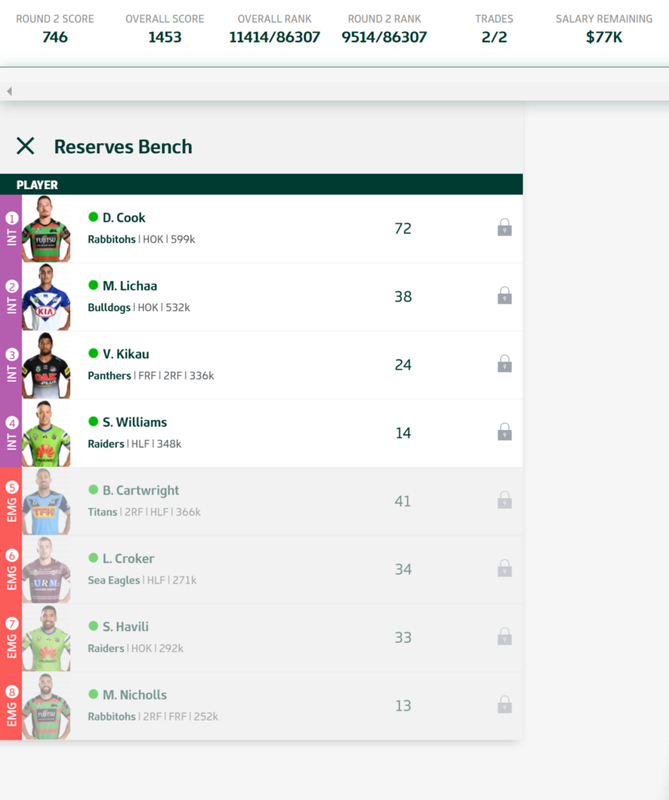 If I get the sniff of Kikau/Godinet/Havili not looking like playing then Kennar comes in. All the best for the season Booze. Light on players who crab across field and rack up TB's. Need less straight runners. @No Worries wrote: Light on players who crab across field and rack up TB's. Need less straight runners. Cheers for the heads up on that regarding Marshall being possibly out. Would make it an interesting call to see how the minutes would be spread but you would think Godinet would get the lion's share as he was picked on merit/pre season form and to fit their game plan. At this stage will pick and stick with him, though I can afford rochow as well if needed. 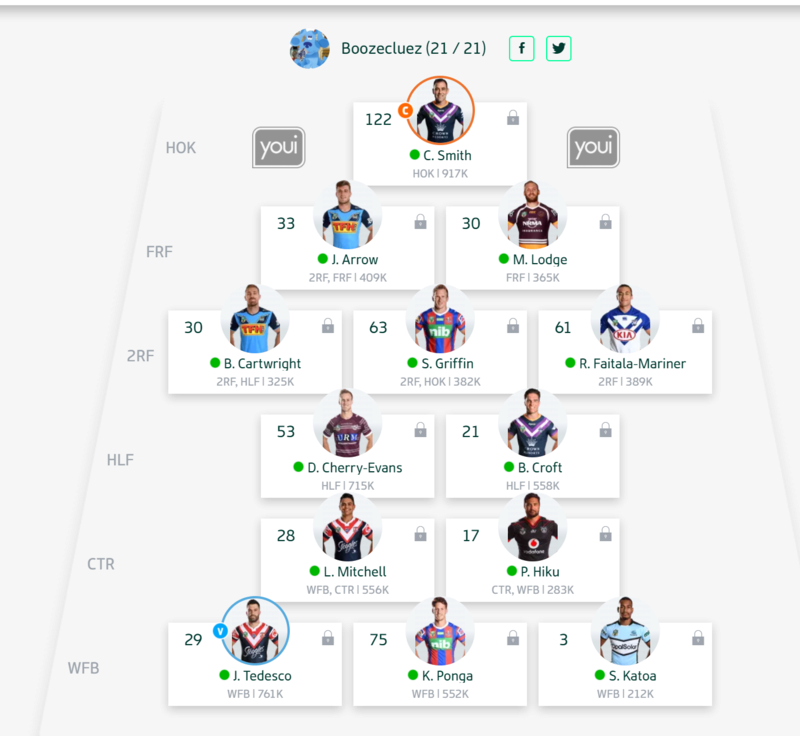 Had Kikau in my 17 for most of the week and was tossing up between Godinet and Rochow after downgrading SST once the Katoa injury happened. Made a wrong call on that one and missed out on some points but you can’t always get them right. Positives are that a few of my guns should improve after off games, managed to get a few well scoring cheapies and with 502k in the bank I will have plenty of options to make a few changes. A couple of upgrades should help my team perform a lot better this week. Looked elusive in the first game and while not heavily involved still managed to still score well. Has bulked up a bit in the off season and should be at least enjoyable to watch play in a decent dragons team. Should get some decent metres due to the big dragons pack dominating up front as well while capable of a large score via some tackle breaks too. Bringing him in gives me a third solid WFB and hopefully should be set and forget back there. Had a great off season and even better first game against the Roosters playing the full 80 minutes. The good thing was it at least gave me a week to look at him and how he would be used. With the next games being tough and the Tigers being defensively poor he should continue getting good minutes there and it's really his spot to lose now. 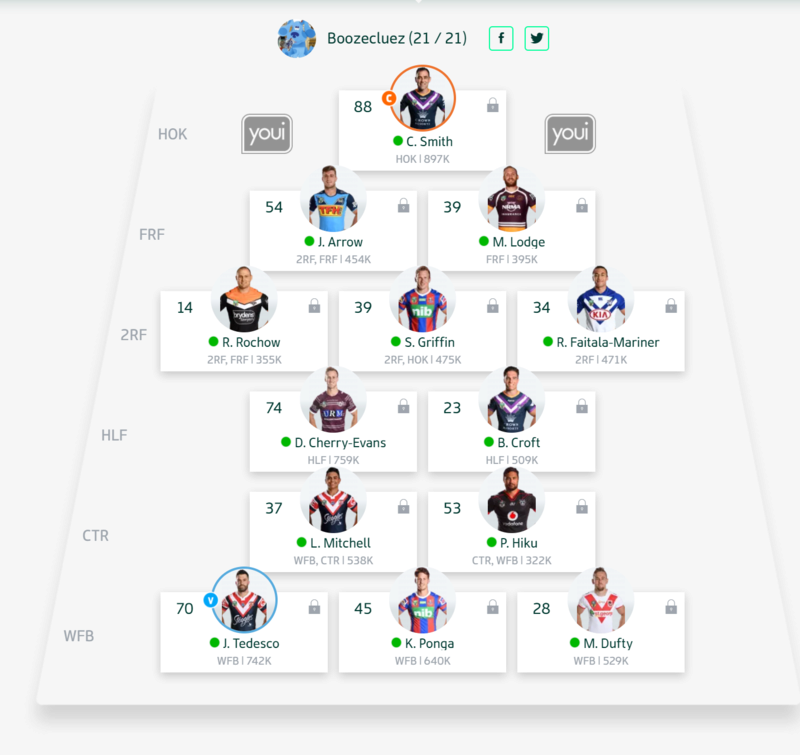 Think I will trade Dufty out this week I think, after only just coming in. Don't know what I was thinking when I did bring him and even overlooked his previous years stats/scores.Look he wasn't terrible but with the limited spots in the team this year, I need either keepers or cows earning and he meets neither of these. While I believe he will probably still average out around 40-45 it make take a while and would rather a Tedesco/Ponga/RTS/Rapana/Edwards over him. So who I had originally planned to bring in last week was Corey Thompson, so this trade will have cost me 60k and a trade but better to make that call now and move on. However even if Thompson scores 5 points less than Dufty for the next few weeks, he makes 200k which is huge. This gives me some cash up my sleeve again and gives me options in the next few weeks for upgrades. Have to make a big call somewhere in the team and this is it. Looking at my front row again with Arrow/Lodge/Rochow I feel I need some insurance from a locked down Prop. Just need him to hold the fort until I can afford a better player and ride him up to a discounted Fifita/Taupau/Vaughan. Should have started with him and then he was meant to come in last week but had a brain spasm and sometime this happens in this crazy game. Thompson has the fullback slot again this week and potentially a while longer given the Tigers start. Brought in for the cash making ability and potential to score well and with a -11 BE he should do that. By the time Dufty get's back up to speed and scoring well then Thompson would be the same price so this needs to happen now. Looks like your going ok Boozy. Well better than me anyway. Bit harder to get into the swing with the new setup. I feel the 21 man squad gives you very little room for error. @Sik wrote: Looks like your going ok Boozy. Well better than me anyway. Bit harder to get into the swing with the new setup. I feel the 21 man squad gives you very little room for error. Hey Sik, wouldn't call it a great start but slowly getting there. With only 2 trades a week and little room for error it has been hard getting in all the right cows and fixing the holes in the team. Bit of bad luck with my 2 trades this week bringing in TPJ who hurt his hammy and Thompson taking a head knock but that's footy. In hindsight starting with all the cheap ctrs/wfb would have worked out well and would love isaako, Kennar, Sami but got to make do with the team you start with. 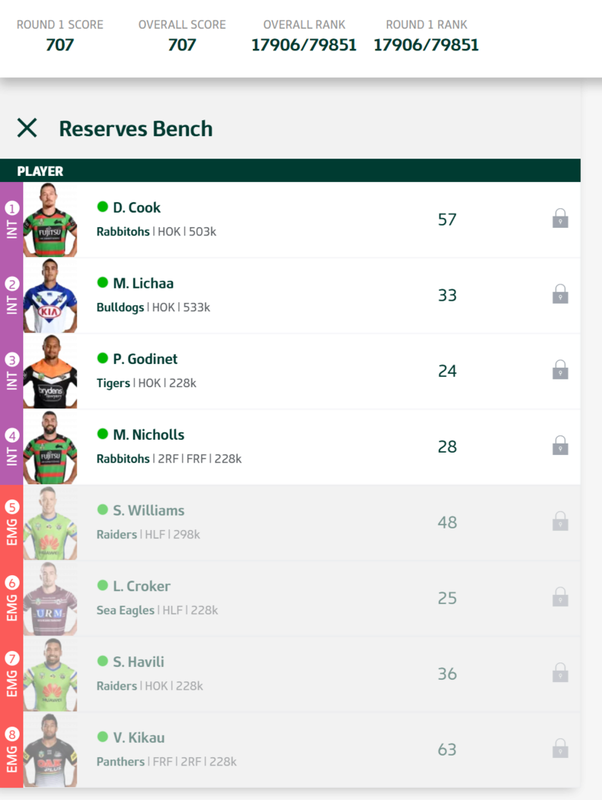 Took a calculated risk in waiting to move on Croft/Lichaa which cost me a few points but nothing worse than moving on a player and they then go huge on you. Murray had the smaller BE over TPJ this week which is why i went in that order and JMK I wanted a week to look at so these look like 2 possible targets.